10 Best IP Monitor Software/Tools for Managing & Monitoring Servers & more! Networks and its immediate surroundings are a busy place – Bandwidth battles for resource hungry applications, security threats and the need for constant up-time means you’ll have to stay on top of your network’s performance, security and reliability all the time. This is not always easy to stay on top of. But the good news is IP Monitoring Software and tools greatly ease your job of monitoring and managing your critical resources. These tools review, analyze and manage network traffic, interfaces and applications seamlessly, and through such analysis they give you in-depth reports on Network & Application Performance. 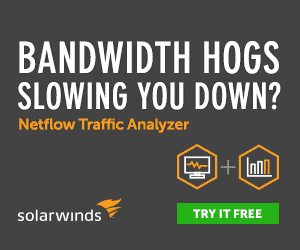 Identifies the slow and bandwidth-hungry applications, so you can plan better for future growth and procurement of new devices. Detects spyware, ransomware and other malware attacks before they compromise your network and critical resources before they become a problem (think Ransomware detection). Detects the outflow of personal information to clients. This is particularly important if your organization is in the financial world. The above list clearly shows that you need a comprehensive and reliable tool for monitoring your network. Below you’ll find a list of the Best 10 IP monitor software and tools that can help you accomplish all of the above tasks and many more. These tools are highly rated by users and come with comprehensive features to make IP monitoring a thorough and automatic process. Some are FREE and Others have 30 Day Trials and have comprehensive Support thereafter. 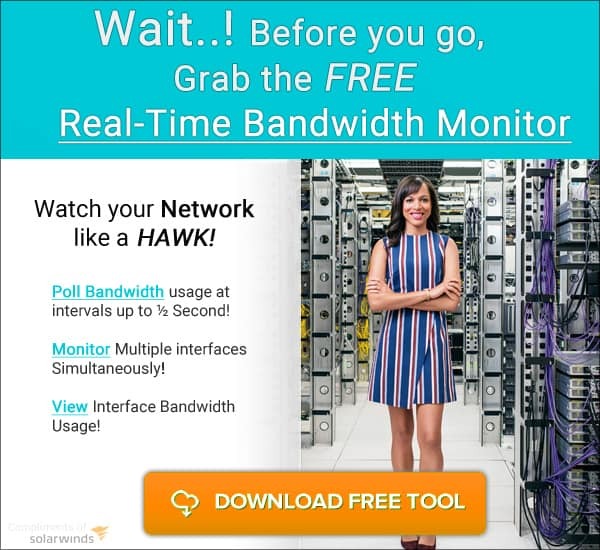 Solarwinds IP Monitor is one of the Most Comprehensive IP Monitoring tools that comes from Solarwinds, one of the leaders in Network monitoring software solutions. 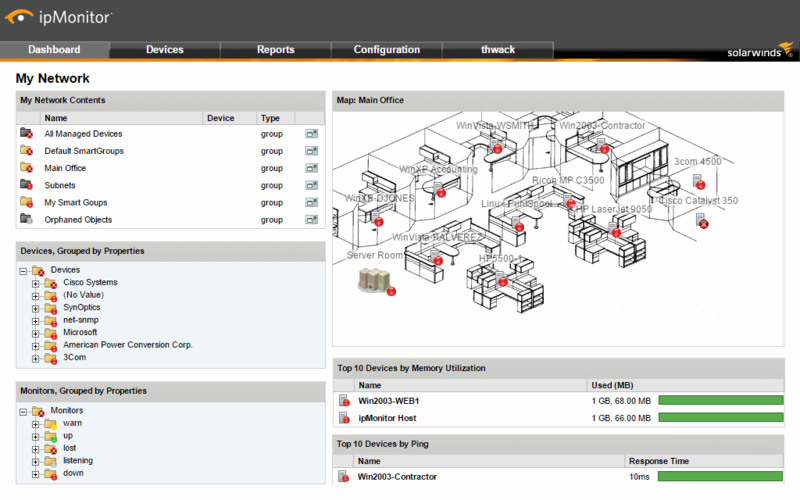 You can monitor different devices and applications from a single console. Runs on minimal system requirements. In fact, it uses a flat storage system, so there is no hassle of creating and maintaining a separate database. Based on a proven agentless monitoring architecture. Sends alerts for performance and availability issues. You can choose to receive alerts through a dozen notification types such as email, text message and Windows Event log files. Monitors network status on maps, so you can quickly drill down to the root cause of the problem. Comes with built-in reporting tool that allows you to create custom reports. 30 Day Free Trial to Test in your Network! PRTG is an all-in-one monitoring tool from Paessler, a German company that has been specializing in manufacturing a wide range of network and device scanners since 1997. Here is a list of features available in PRTG. 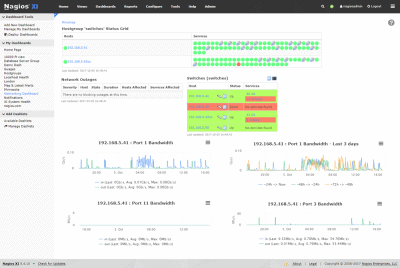 A central dashboard gives you a bird’s eye view of your network’s performance. You get instant notifications if any metric goes below the pre-determined threshold limit. PRTG pings all available IP addresses in your network and automatically begins to monitor the devices associated with these IP addresses. Comes with more than 200 pre-configured sensors that monitor different metrics. Easy to set up and starts monitoring right away. Comes with an API for easy customizing. The pricing model of PRTG works slightly differently when compared to other products. Here, the pricing depends on the number of sensors you add. The pricing structure for sensors are as follows. If you want unlimited sensors, choose from the following two plans. The above cost includes one year maintenance. To renew, pay 25% of the cost of the license. ManageEngine’s OpManager is a tool that ensures all your network devices are up and running continuously. Provides real-time views of availability statistics. Monitors different devices such as switches, routers, servers and any other SNMP enabled devices. Gives detailed analysis of the performance of each device, so you can stay on top of possible problems. Opmanager pings a device every two minutes and if the devices doesn’t respond after two pings, it marks the device as unavailable. You can customize the number of pings and their time interval. Checks for a device’s availability using ICMP Ping. Gives four other statuses to avoid false alerts. These four statuses are – On hold (to pause monitoring a device), On maintenance (a scheduled period of maintenance), Parent Down and Dependent Down (stops polling a dependent device when the parent device is down). Monitors HTTP/HTTPS, Intranet sites, web server farms, web applications with a login, authenticated websites and more. Gives the option to remotely manage and monitor processes that are running on servers. Works well on Windows, Linux, Solaris, UNIX, HP, IBM, AIX, ESX and VMware servers. Contact the sales team at https://www.manageengine.com/network-monitoring/get-quote.html to get a quote. 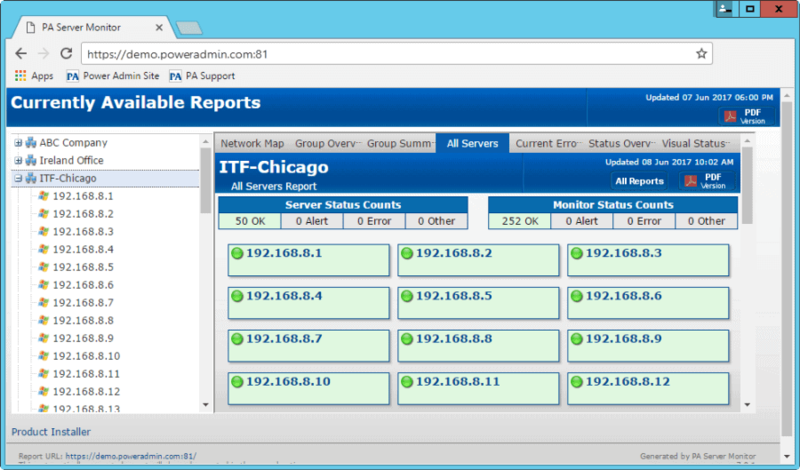 Power Admin is a powerful network and server monitoring software that reports the performance and availability of devices in your network. The features of Power Admin are listed below. Securely monitors remote and local servers. Gives a complete view of your disks. Provides proactive warnings, so you can fix problems before they get out of hand. Configuration is quick and simple. No scripts or configuration files are required. Helps you to know the status of your network at all times. Comes with a neat interface for mobile devices. Application console is simple to use and intuitive for the most part. Monitors both Linux and Windows devices. Automates common IT tasks through the Action Scheduler module. Database Monitor modules watches activities on database including the transaction log size. Event Validator Monitor module checks if certain events are completed successfully. Some examples of events include backup, updation of anti-virus pattern file and so on. Sends alerts if any of these tasks have failed. You can execute custom scripts written in Visual Basic programming language. Constantly monitors the ages of files and alerts if they get too old. Power Admin offers many editions and pricing options. Contact the sales team at https://www.poweradmin.com/contact-us/?f=p for corporate edition. Windows operating systems XP, 7,8,8.1 and 10. Windows Server: 2003, 2008, 2008 R2, 2012, 2012 R2 and 2016. 50 to 500 MB of free physical RAM for monitoring. 50MB to 50GB of disk space, depending on what is being monitored. No sign up or credit card is required and all the features are available for a limited period of 30 days. 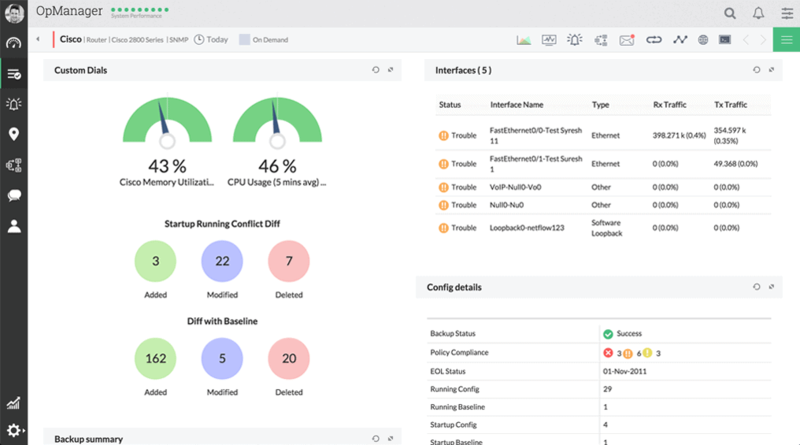 VisualPulse is a simple and powerful tool that ensures the performance and availability of your network devices. Gives detailed information about a wide range of parameters such as latency, packet loss, down time, response time and more. Pings continuously for response reporting. You can change the ping settings to suit your preferences as well. Generates historical and real-time reports. 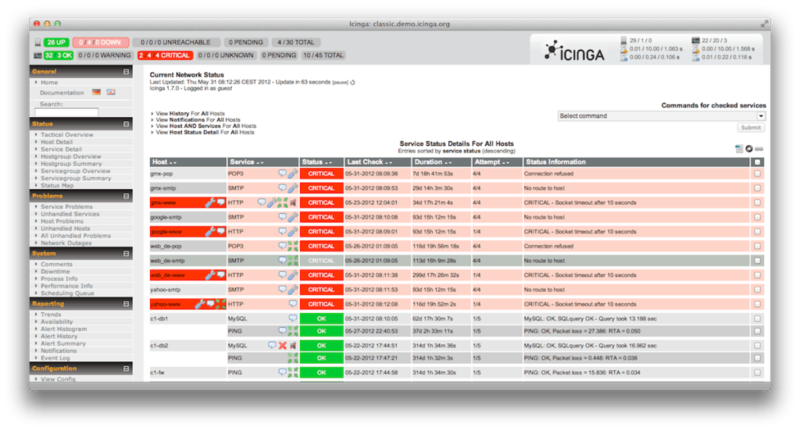 Icinga is an open source network monitoring application that was originally created as a fork of the popular Nagios application. The idea behind creating Icinga was to rectify the shortcomings in Nagios and to add new features to keep pace with changes in IT design and development. Supports three different types of logging, namely, file logging, syslog on LINUX/UNIX and console logging. You can enable additional loggers as well. Icinga Data Output (IDO) feature exports all configuration and status information into a database. It maintains plug-in and configuration compatibility with Nagios, so migration between the two is simple and easy. Monitors network services such as SMPTP, NNTP, HTTP and POP3, host resources such as disk usage and CPU load, and server components such as switches, routers and sensors. Offers a simple plug-in design to help you develop your own service checks. Defines network host hierarchy through parent hosts. Detects and distinguishes between hosts that are down and those that are not reachable. Defines event handlers that can be run during service. Notifies the right contact person through many notification methods such as emails, instant message and even through user-defined methods. Escalates alerts to other users or communication channels when needed. Two user interfaces – Icinga Classic UI and Icinga Web, gives you comprehensive information about the availability and performance of different devices. Its reporting module is based on Jasper Reports. Gives extensive information to help you with capacity planning. Provides performance graphing with the help of add-ons. Nagios comes with the following features. Monitors the network for problems caused due to a wide range of factors including overloaded data links and network connections. 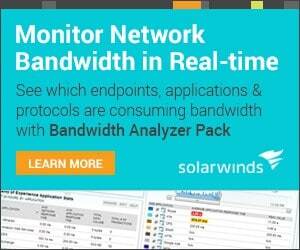 Supports both agent-based and agentless monitoring. There are more than 5000 different add-ons available for Nagios. Quickly detects applications, services or process problems. Provides tools for monitoring not just the application, but also its state. Monitors availability, uptime and response time of every node in the network. Nagios core engine is free. But you’ll have to pay a subscription fee for the products built on it such as Nagios XI and Nagios Log Server. 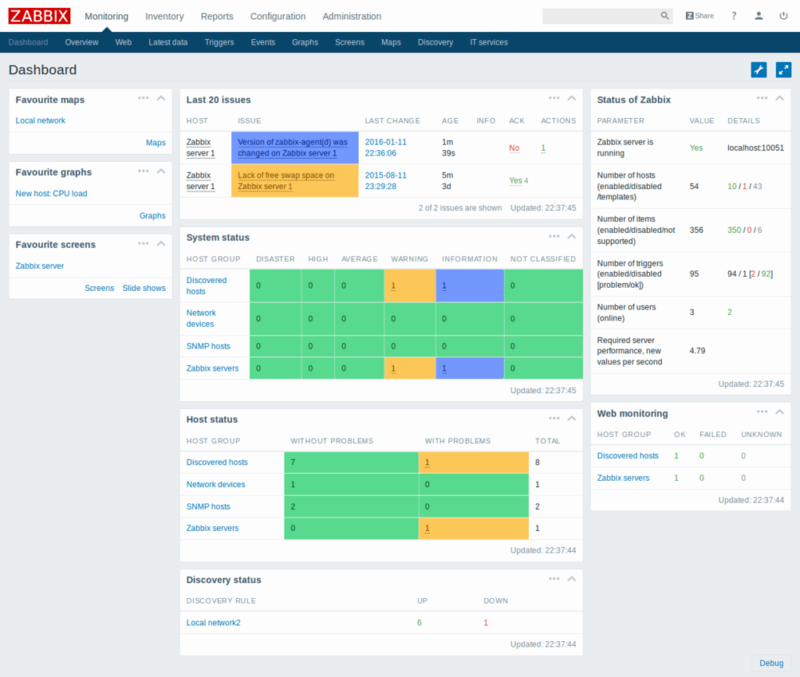 Zabbix is an enterprise class monitoring platform that provides in-depth information about the performance of all devices on your network. The features of Zabbix are listed below. Collects metrics from any device, system or application. A native Zabbix agent runs on different platforms such as Windows, UNIX and Linux to collect data such as CPU, memory, disk space and more. Supports SNMP and IPMI agents. Executes custom scripts. This helps to extend the functionality of Zabbix as you can create scripts in Perl, Python and Ruby. Calculates and aggregates different values to give you a comprehensive picture. Its web module can execute pre-defined scenarios and store the results. This feature can be particularly useful for web monitoring. Automatically detects problem states within the incoming flow of data. A separate analysis is not required. Predictive functions help to predict the possibility of a problem, so you can fix the cause even before the problem occurs. Uses information obtained from different devices to build a trigger expression. Supports six trigger classifications, namely, disaster, high, average, warning, information and not classified. Comes with a widget-based dashboard that gives you the flexibility to choose the information you want to see. 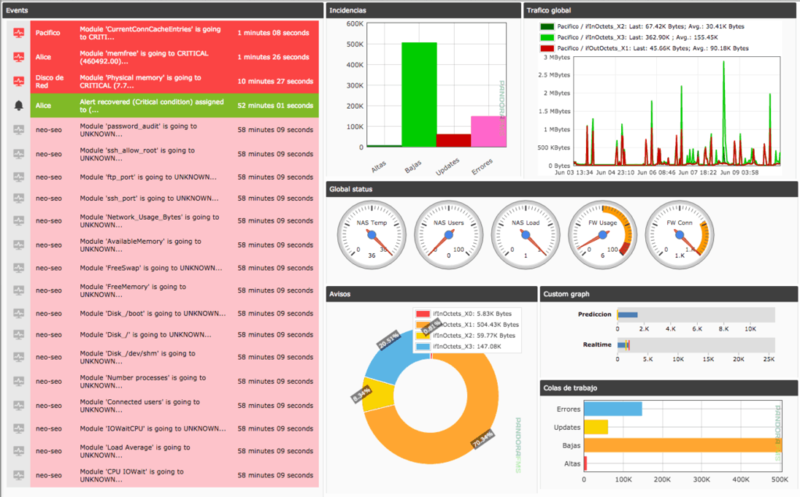 Displays graphs, network maps, slideshows and drill-down reports. User interface is simple and powerful. It is a one-stop place to get all the information you want. You can choose to allow Zabbix to fix issues automatically. Choice to escalate problems based on user-defined service levels. Messages are customized based on recipient’s role and available information. Supports custom templates, over and above the hundreds of templates built by the Zabbix community. Periodically scans and discovers devices. Automatically creates triggers, items and graphs for different elements on a device. Starts monitoring new equipment automatically without any prompt from user. Ability to collect data from thousands of monitored devices. Integrates well with many third-party software. Open-source and 100% free to use. Pandora FMS is a complete open-source monitoring solution that gives comprehensive information about network equipment, servers and different kinds of applications. Pandora FMS has the following features. Monitors performance and availability of different devices and applications. Has an event-based management architecture. Supports up to 1000 agents in the OpenSource version and 2,000 agents in the Enterprise edition. Multi-platform agents are available for Windows, Linux, HP-UX, Solaris and BSD. Provides support for many plug-ins in the Enterprise edition. Role-based access control levels are supported. 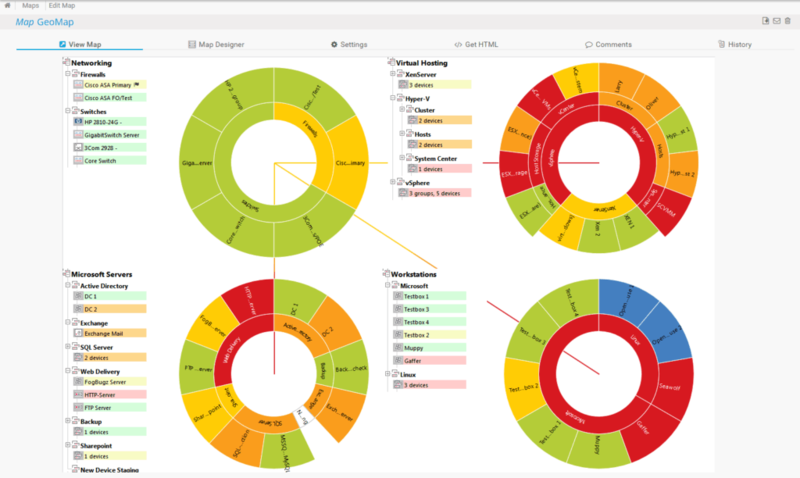 A customizable and intuitive dashboard is available in the Enterprise edition. Supports IPAM, SSH, SNMP, IPv6, WMI and Netflow. The Open source version is free, but you have to pay a fee for the Enterprise edition. Contact the sales team to get a quote for the Enterprise edition. 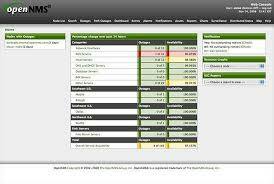 OpenNMS is an open-source platform designed for building a wide range of network monitoring solutions. There are two distributions in OpenNMS, and they are: Meridian and Horizon. While Meridian is ideal for businesses that need stability and long-term support, Horizon is where innovation happens quickly thereby making it ideal for monitoring new technologies and IT ecosystems. Polling intervals change automatically, depending on events such as outages. Gathers information from outside sources too such as vulnerability information from Nessus tailed log files. Sends alerts through many channels such as email, Slack, MatterMost, Jabber, XMPP, microblog notifications, external scripts and APIs. Horizon edition is free while Meridian comes with a yearly subscription fee. To conclude, IP Monitoring Tools and software are essential to protect your company’s valuable resources and to alert if something is wrong with any Device, Service or Application in your network infrastructure. The tools discussed above are comprehensive and will give you all the information you need to stay on top of everything that is happening in your network at anytime of the day or night. In addition, it saves time, money and effort for you as an organization by minimizing downtime and really ensuring that all critical production systems are up at the most important hours of the day/night.